The Texas Rangers were unofficially created by Stephen F. Austin in a call-to-arms written in 1823 and were first headed by Captain Morris. After a decade, on August 10, 1835, Daniel Parker introduced a resolution to the Permanent Council creating a body of rangers to protect the border. The unit was dissolved by the federal authorities during the post–Civil War Reconstruction Era, but was quickly reformed upon the reinstitution of home government. Since 1935, the organization has been a division of the Texas Department of Public Safety (TxDPS); it fulfills the role of Texas’ state bureau of investigation. As of 2015, there are 162 commissioned members of the Ranger force. The rangers were founded in 1823 when Stephen F. Austin, known as the Father of Texas, employed ten men to act as rangers to protect 600 to 700 newly settled families who arrived in Texas following the Mexican War of Independence. While there is some discussion as to when Austin actually employed men as “rangers”, Texas Ranger lore dates the year of their organization to this event. The Texas Rangers were formally constituted in 1835 and, in November, Robert McAlpin Williamson was chosen to be the first Major of the Texas Rangers. Within two years the Rangers comprised more than 300 men. John Jackson Tumlinson Sr., the first alcalde of the Colorado district, is considered by many Texas Ranger historians to be the first Texas Ranger killed in the line of duty. One of his most urgent issues was protection of settlers from theft and murder by marauders. On his way to San Antonio, in 1823, to discuss the issue with the governor, Tumlinson was killed by Native Americans. His traveling companion, a Mr. Newman, escaped. Tumlinson’s body was never found. The success of a series of campaigns in the 1860s marked a turning point in Rangers’ history. The U.S. Army could provide only limited and thinly-stretched protection in the enormous territory of Texas. By contrast, the Rangers’ effectiveness when dealing with these threats convinced both the people of the state and the political leaders that a well-funded and organized state Ranger force was essential. Such a force could use the deep familiarity with the territory and the proximity with the theater of operations as major advantages in its favor. This option was not pursued, in view of the emerging national political problems (prelude to the American Civil War), and the Rangers were again dissolved. Many Rangers enlisted to fight for the Confederacy following the secession of Texas from the United States in 1861 during the Civil War. In 1870, during Reconstruction, the Rangers were briefly replaced by a Union-controlled version called the Texas State Police, disbanded only three years later. The state election of 1873 saw newly elected Governor Richard Coke and the state legislature recommission the Rangers. 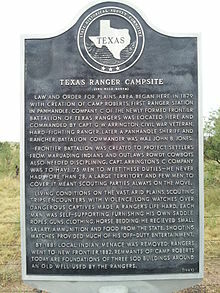 During these times, many of the Rangers’ myths were born, such as their success in capturing or killing notorious criminals and desperados (including bank robber Sam Bass and gunfighter John Wesley Hardin), their involvement in the Mason County War, the Horrell–Higgins Feud, and their decisive role in the defeat of the Comanche, Kiowa and Apache peoples. The Apache “dreaded the Texas Rangers…whose guns were always loaded and whose aim was unerring; they slept in the saddle and ate while they rode, or done without…when they took up our trail they followed it determinedly and doggedly day and night.” Also during these years, the Rangers suffered the only defeat in their history when they surrendered at the Salinero Revolt in 1877. The Rangers next saw serious action at the summit of William Howard Taft and President Porfirio Díaz in 1909, preventing an assassination of both presidents, and during the subsequent Mexican Revolution. The breakdown of law and order on the Mexican side of the border, coupled with the lack of federal military forces, meant the Rangers were once again called upon to restore and maintain law and order, by any necessary means, which again led to excesses. However, the situation necessitated the appointment of hundreds of new special Rangers by the state, which neglected to carefully screen aspiring members. The Rangers were responsible for several incidents, ending in the January 28, 1918, massacre of the male population (15 Mexican men and boys ranging in age from 16 to 72 years) of the tiny community of , Texas, on the Mexican border in western Presidio County. Before the decade was over, thousands of lives were lost, Texans and Mexicans alike. In January 1919, an investigation launched by Texas lawmaker JT Canales found that from 300 to 5,000 people, mostly of Hispanic descent, had been killed by Rangers from 1910 to 1919, and that members of the Rangers had been involved in many acts of brutality and injustice. The Rangers were reformed by a resolution of the Legislature in 1919, which saw the special Ranger groups disbanded and a complaints system instituted. The Great Depression forced both the federal and state governments to cut down on personnel and funding of their organizations, and the number of commissioned officers was reduced to 45, with the only means of transportation afforded to Rangers being free railroad passes or using their personal horses. The agency was again damaged after supporting Governor Ross Sterling in his re-election campaign— after his opponent Miriam Amanda “Ma” Ferguson won, she proceeded to discharge all serving Rangers in 1933. The ensuing disorganization of law enforcement in the state caused the Legislature to engage a firm of consultants to reorganize the state security agencies. The consultants recommended merging the Rangers with the Texas Highway Patrol under a new agency called the Texas Department of Public Safety (DPS). This change took place in 1935, with an initial budget of $450,000. With minor rearrangements over the years, the 1935 reforms have ruled the Texas Rangers’ organization until present day. Hiring new members, which had been largely a political decision, was achieved through a series of examinations and merit evaluations. Promotion relied on seniority and performance in the line of duty. Today, the historical importance and symbolism of the Texas Rangers is such that they are protected by statute from being disbanded. A large proportion … were unmarried. A few of them drank intoxicating liquors. Still, it was a company of sober and brave men. They knew their duty and they did it. While in a town they made no braggadocio demonstration. They did not gallop through the streets, shoot, and yell. They had a specie of moral discipline which developed moral courage. They did right because it was right. As it happened with many Old West myths like Billy the Kid or Wyatt Earp, the Rangers’ legendary aura was in part a result of the work of sensationalistic writers and the contemporary press, who glorified and embellished their deeds in an idealized manner. While some Rangers could be considered criminals wearing badges by a modern observer, many documented tales of bravery and selflessness are also intertwined in the group’s history. Although some measure of truth lies within the tale, it is largely an idealized account written by author Bigelow Paine and loosely based on McDonald’s statements, published in Paine’s 1909 book Captain Bill McDonald: Texas Ranger. In truth, the fight had been so heavily publicized that nearly every Ranger was on hand, including all captains and their superior, Adjutant General Woodford H Mabry. Many of them were undecided on stopping the fight or attending it; and other famous lawmen, such as Bat Masterson, were also present. The orders of the governor were clear, however, and the bout was stopped. Stuart then tried to reorganize it in El Paso and later in Langtry, but the Rangers thwarted his attempts. Finally, the fight took place on the Mexican side of the Rio Grande near Langtry. The Texas Rangers have assisted in many high-profile cases throughout the years. 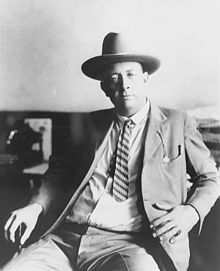 Some cases are deeply entrenched in the Rangers’ lore, such as those of outlaw John Wesley Hardin, bank robber Sam Bass, and Bonnie and Clyde. In 1878, Sam Bass and his gang, who had perpetrated a series of bank and stagecoach robberies beginning in 1877, held up two stagecoaches and four trains within 25 miles (40 km) of Dallas. The gang quickly found themselves the object of pursuit across North Texas by a special company of Texas Rangers headed by Captain Junius “June” Peak. Bass was able to elude the Rangers until a member of his party, Jim Murphy, turned informer, cut a deal to save himself, and led the law to the gang. As Bass’ band rode south, Murphy wrote to Major John B. Jones, commander of the Frontier Battalion of Texas Rangers. One of Texas’ deadliest outlaws, John Wesley Hardin, was reputed to be the meanest man alive, an accolade he supposedly earned by killing a man for snoring. He committed his first murder at age 15, and admitted to killing more than 40 men over 27 years. In May 1874, Hardin killed Charles Webb, the deputy sheriff of Brown County and a former Texas Ranger. 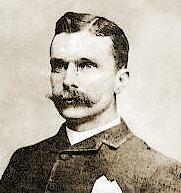 John Barclay Armstrong, a Texas Ranger known as “McNelly’s Bulldog” since he served with the Special Force as a sergeant and Captain Leander McNelly’s right hand, received permission to arrest the outlaw. He pursued Hardin across Alabama and into Florida, and caught up with him in Pensacola. After Armstrong, Colt pistol in hand, boarded a train that Hardin and four companions were on, the outlaw shouted, “Texas, by God!” and drew his own pistol. When it was over, one of his gang members was killed, and his three surviving friends were staring at Armstrong’s pistol. Hardin had been knocked unconscious. Armstrong’s hat had been pierced by a bullet, but he was uninjured. Hardin was charged for murder, convicted, and sentenced to 25 years in prison. Seventeen years later, Hardin was pardoned by Governor Jim Hogg and released from prison on March 16, 1894. He moved to El Paso, where he began practicing law. On August 19, 1895, he was murdered during a poker game at the Acme Saloon over a personal disagreement. In 1909, Private C.R. Moore of Company A, “performed one of the most important feats in the history of the Texas Rangers”. William Howard Taft and Porfirio Díaz planned a summit in El Paso, Texas, and Ciudad Juárez, Mexico, a historic first meeting between a U.S. president and a Mexican president and the first time an American president would cross the border into Mexico. But tensions rose on both sides of the border, including threats of assassination, so the Texas Rangers, 4,000 U.S. and Mexican troops, United States Secret Service agents and United States Marshals were all called in to provide security. Frederick Russell Burnham, the celebrated scout, was put in charge of a 250-person private security detail hired by John Hays Hammond, a nephew of Texas Ranger John Coffee Hays, who in addition to owning large investments in Mexico was a close friend of Taft from Yale University and a U.S. Vice-Presidential candidate in 1908. On October 16, the day of the summit, Burnham and Private C.R. Moore discovered a man holding a concealed palm pistol standing at the El Paso Chamber of Commerce building along the procession route. Burnham and Moore captured, disarmed, and arrested the would-be assassin within only a few feet of Taft and Díaz. The Bandit War, a small but major campaign during the Border War, was fought in 1910–1915 in Texas. The conflict was a series of violent raids conducted by Mexican revolutionaries in the American settlements of Tamaulipas, Coahuila and Chihuahua. The Texas Rangers became the primary fighting force and protection of the Texans during the operations against the rebels. The Mexican faction’s incursion in the territory were carried out by the Seditionistas and Carrancistas, led by major political leaders such as Basilio Ramos and Luis de la Rosca. However, the Seditionistas were never able to launch a full-scale invasion of the United States so they resorted to conducting small raids into Texas. 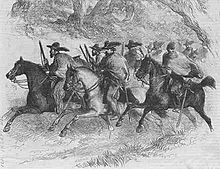 Much of the fighting involved the Texas Ranger Division though the United States Army also engaged in operations against the rebels. The Texas Rangers were led by Captain Harry Ransom on the orders of the Governor of Texas, James E. Ferguson. After tracking the Barrow gang across nine states, Hamer, in conjunction with officials in Louisiana, learned Bonnie and Clyde had visited a home in Bienville Parish on May 21, 1934, and that Clyde had designated a rendezvous point in the vicinity with gang member Henry Methvin, in case they were later separated. Methvin, allegedly cooperating with law enforcement, made sure he was separated from them that evening in Shreveport, and the posse set up an ambush along the route to the rendezvous at Highway 154, between Gibsland and . Led by former Rangers Hamer and B. M. “Manny” Gault, the posse included Sheriff Henderson Jordan and Deputy Prentiss Oakley of Bienville Parish, Louisiana, and Dallas County Deputies Bob Alcorn and Ted Hinton. They were in place by 9:00 that night, waiting all through the next day, but with no sign of Bonnie and Clyde. Around 9:00 a.m. on May 23, the posse, concealed in the bushes and almost ready to concede defeat, heard Clyde’s stolen Ford V-8 approaching. When he stopped to speak with Henry Methvin’s father (planted there with his truck that morning to distract Clyde and force him into the lane closest to the posse), the lawmen opened fire, killing Bonnie and Clyde while shooting a combined total of approximately 130 rounds. The Texas Rangers’ internal organization maintains the basic outlines that were set in 1935. The agency is divided into seven companies: six District Companies lettered from “A” to “F”, and Headquarters Company “H”. The number of personnel is set by the Texas Legislature; as of 2014, the Texas Rangers number 150 commissioned officers, one forensic artist, one fiscal analyst and 24 civilian support personnel. The Legislature has also made a provision for the temporary commissioned appointment of up to 300 Special Rangers for use in investigative or emergency situations. The statewide headquarters of the Texas Rangers is located in Austin at the Texas DPS headquarters. As of 1 October 2014, the Chief of the Texas Rangers is Assistant Director of DPS Randall Prince. Modern-day Rangers (as well as their predecessors) do not have a prescribed uniform, per se, although the State of Texas does provide guidelines as to appropriate Ranger attire, including a requirement that Rangers wear clothing that is western in nature. Currently, the favored attire includes white shirt and tie, khaki/tan or gray trousers, light-colored western hat, “ranger” belt, and cowboy boots. Historically, according to pictorial evidence, Rangers wore whatever clothes they could afford or muster, which were usually worn out from heavy use. While Rangers still pay for their clothing today, they receive an initial stipend to offset some of the costs of boots, gunbelts and hats. The wearing of badges became more common in the late 1800s. Historians have put forth several reasons for the lack of the regular use of a badge; among them, some Rangers felt a shiny badge was a tempting target. Other historians have speculated there was no real need to show a badge to a hostile Native American or outlaw. Additionally, from a historical viewpoint, a Ranger’s pay was so scanty that the money required for such fancy accoutrements was rarely available. Nevertheless, some Rangers did wear badges, and the first of these appeared around 1875. They were locally made and varied considerably from one to another, but they invariably represented a star cut from a Mexican silver coin (usually a five-peso coin). The design is reminiscent of Texas’s Lone Star flag. Although present-day Rangers wear the familiar “star in a wheel” badge, it was adopted officially only recently. The current design of the Rangers’ badge was incorporated in 1962, when Ranger Hardy L. Purvis and his mother donated enough Mexican five-peso coins to the DPS to provide badges for all 62 Rangers who were working at that time as commissioned officers. The Lone Ranger, which aired on radio from 1933 to 1954 on Mutual, NBC Blue and ABC and on television from 1949 to 1957 on ABC and was that network’s first hit series, was the tale of a former Texas Ranger and starred Clayton Moore and for one season John Hart. CBS had a children’s program from 1955 to 1959, Tales of the Texas Rangers, with Willard Parker and Harry Lauter as fictional rangers, which ran on the Saturday morning schedule and later in rebroadcasts on ABC. Walter Hill‘s film Extreme Prejudice (1987), starring Nick Nolte, Powers Boothe, Michael Ironside, and María Conchita Alonso, focuses on the fight between a ranger and his former childhood friend, turned drug lord. In Harry Turtledove‘s alternative history novel, Settling Accounts: In at the Death (2007), Texas Rangers from the newly recreated Republic of Texas, detain and arrest Jefferson Pinkard, commander of Camp Determination. In the television series From Dusk ’til Dawn (2014) includes Texas Rangers as the primary antagonists hunting the main characters and also discusses some of the history of racial tension along the Texas–Mexico Border and the suffering of the Mexican and Mexican American peoples of that area at the hands of “Los Rinches” or the Texas Rangers. In 2016 Faber and Faber published the first in a series of novels written by JM Gulvin featuring 1960’s Texas Ranger John Quarrie. ^ “Table 1. Annual Estimates of the Resident Population for the United States, Regions, States, and Puerto Rico: April 1, 2010 to July 1, 2015”. U.S. Census Bureau. December 23, 2015. Archived from the original (CSV) on December 23, 2015. Retrieved December 23, 2015. ^ a b “ Texas Department of Public Safety – Texas Rangers“. Retrieved March 7, 2019. ^ “DPS announces staff promotions”. May 15, 2018. Retrieved March 2, 2019. ^ “TxDPS – Texas Rangers Historical Development”. Txdps.state.tx.us. Retrieved March 15, 2016. ^ James Pinkerton, Houston Chronicle (September 10, 2009). “Perry announces ‘Ranger Recon’ to work border”. Houston Chronicle. Retrieved March 15, 2016. ^ “Texas Ranger Hall of Fame”. Texasranger.org. Archived from the original on March 20, 2016. Retrieved March 15, 2016. ^ “Private Lewis F. Scheuster, Texas Rangers, Texas”. Odmp.org. Retrieved March 15, 2016. ^ “Mexico, Sep. 20–23, 1846 | Texan Volunteers at Monterrey”. The Battle of Monterrey. Archived from the original on July 7, 2011. Retrieved March 15, 2016. ^ “Tumlinson, John Jackson, Sr. | The Handbook of Texas Online| Texas State Historical Association (TSHA)”. Tshaonline.org. Retrieved March 15, 2016. ^ “The Bismarck tribune. (Bismarck, N.D.) 1916–current, February 8, 1918, Image 2 « Chronicling America « Library of Congress”. Chroniclingamerica.loc.gov. February 8, 1918. Retrieved March 15, 2016. ^ “The division relating to the Texas Rangers may not be abolished”. Acts 1987, 70th Leg., ch. 147, Sec. 1, September 1, 1987. ^ “Texas Ranger Hall of Fame”. Texasranger.org. Archived from the original on February 23, 2009. Retrieved March 6, 2009. ^ Miletich, Leo N. Dan Stuart’s Fistic Carnival (College Station: Texas A&M, 1994), pp. 147–58. ^ “Plan of San Diego | The Handbook of Texas Online| Texas State Historical Association (TSHA)”. Tshaonline.org. Retrieved March 15, 2016. ^ “Ralph Wranker”. Taliesyn.com. Retrieved March 15, 2016. ^ Nelson, Aaron (December 11, 2017). “Reporter”. San Antonio Express News (Morning). San Antonio Express News. San Antonio Express News. Retrieved May 13, 2018. ^ Colloff, Pamela (January 20, 2013). “Unholy act”. Texas Monthly. Retrieved October 21, 2016. ^ “Texas Department of Public Safety – Texas Ranger Duties”. Txdps.state.tx.us. Archived from the original on March 4, 2009. Retrieved March 6, 2009. ^ “Texas Department of Public Safety – Texas Rangers Personnel”. Txdps.state.tx.us. Archived from the original on January 27, 2010. Retrieved August 31, 2010. ^ “Texas Ranger Hall of Fame & Museum – Texas Rangers Today”. Texasranger.org. Retrieved March 15, 2016. ^ “The Texas Ranger Costume”. Curtrich.com. Retrieved March 15, 2016. ^ “Texas Department of Public Safety – Texas Rangers, Texas, Fallen Officers”. Odmp.org. Retrieved November 14, 2018. ^ “Texas Rangers, Texas, Fallen Officers”. Odmp.org. Retrieved November 14, 2018. ^ “Tales of the Texas Rangers”. Internet Movie Database. Retrieved August 9, 2014. Ford, John Salmon. Rip Ford’s Texas, University of Texas Press (1987). ISBN 0-292-77034-0. Hampton, Benjamin B (April 1, 1910). “The Vast Riches of Alaska”. Hampton’s Magazine. 24 (1). “Mr. Taft’s Peril; Reported Plot to Kill Two Presidents”. Daily Mail. London. October 16, 1909. ISSN 0307-7578.